The Met Office has issued a snow and ice warning for Calderdale. 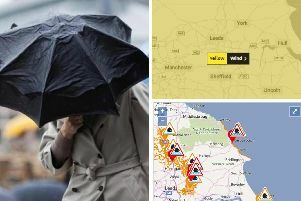 The yellow “be aware” warning has been issued and is valid from 6pm today (Wednesday) to 11.55pm tomorrow. A Met Office spokesperson said: “A wintry mix of sleet and snow showers are likely to extend inland across parts of eastern, southeastern and central England on Wednesday night into Thursday. “These are likely to lead to icy stretches on untreated surfaces. “Snow accumulations of 1-3 cm are also possible in places, mainly above 150 m with perhaps 8 cm over the North York Moors. The spokesperson said the public should be aware of the potential for disruption to travel.